Thanks for all your well wishes this week. I didn’t mean to sound so self-absorbed in my post the other day. But we’ve all been there and it means a lot to me that you guys put up with my whining. So thank you. Tons. It helped more than you know. On to the outfit, though as I’m still not feeling super inspired to write tons. I pulled out this Target dress this morning, which reminded me of Sunday’s launch of the Rodarte line for Target. Super stoked. You better believe I’ll be there, first thing in the morning. i can't wait for rodarte either! i'm so excited. and your hair looks gorgeous here! love the socks with heels. Love your dress, it´s so cute!!! I like the idea tigths+socks!!! I've gotten lazy with the commenting, but this post is forcing me to do it – I love your outfit, your blog, your simple little writing, everything. Saved to my inspiration file. Love your dress! The blue is a gorgeous color!! Really like this outfit! The dress is cool and I love your hair too! very cute, love the tux blazer with the floral dress! Um…your hair is freaken unbelieveable! UNBELIEVEABLE! (did I spell that right). Outfit is great!and love your hair. I know this is a fashion blog and not a hair blog but do you color your hair? I'm looking for a color just like that! Thanks guys! @Linda, ha, I woke up extra early today to curl it nice and big. 🙂 Thank god for hair spray! @Melanie, no, I don't color my hair. It's pretty dark, almost black. Not sure if that helps you at all? Hope to see you there! You look great in this! I'm pretty stoked for the Rodarte line, too. I just love this dress on you. This outfit is simple, but gorgeous. I can't wait for the launch as well! But so many girls are going to be wearing the collection that it won't be as unique anymore. That's what's happened to a lot of stuff at Target. However, I DO love this DRESS!! I'll be there too, but I'm pretty sure no one in Alaska even knows what Rodarte is, or cares. I can't remember if I already left a comment about this but – if you haven't looked already, check your Target. Mine already has Rodarte stuff out. And already out of my size in most of it. Sad day. But hopefully the Sunday launch means more stuff. I hope, I hope, I hope! love the dress! target is getting pretty good with their trendy items. i think it's great. Love the outfit. I would go early. My target already had them out. I posted a review of soemthing if you wanna look. But I heard they are putting it out early in a lot of places. Just came across your blog; I'm in love with the colour and print of your dress. It's so summeresque and happy. And you have such AMAZING hair. It's so perfect. You should do hair commercials. Well, maybe not, but I'm trying to emphasize how amazing it is! i have been anxious awaiting the rodarte line. 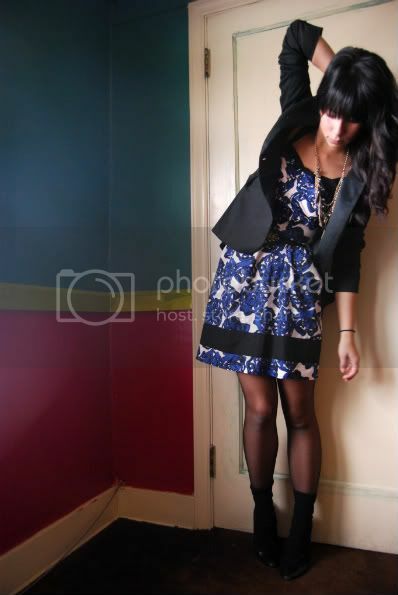 I love, love the colors of your dress, & how you paired it with that blazer! So gorgeous. I love your heels with socks! I'm really excited to check out the new Rodarte as well. Annie. Eeep, your dress is from Target? It's gorgeous! If I'd seen that same one, I'd have scooped it up. Can't wait to see your Rodarte for Target finds. let's see the rodarte pieces. i am loving my mustard sweater! I love the dress and the socks are wonderfully cute! Now, I have to say, I have hair quite similar to yours… thick and curly/wavy… but it never quit looks as wonderful as your does! How do you get it so wonderfully shiny with no fly-aways? I love the print and colour on that dress.. so pretty!